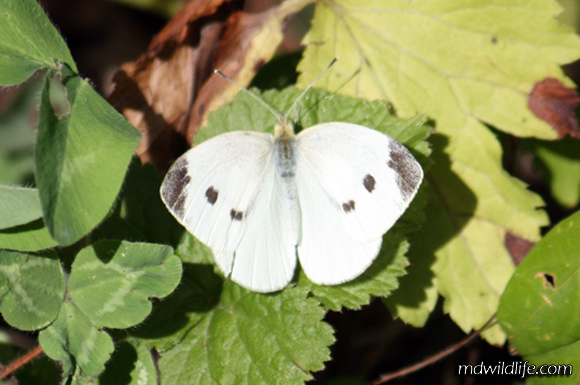 The Cabbage White (Pieris rapae) is a small and quick butterfly that is very common throughout the state. It is also fairly easy to identify as the markings of butterflies in the white family are usually quite prominent. A Cabbage White pokes at a flower. 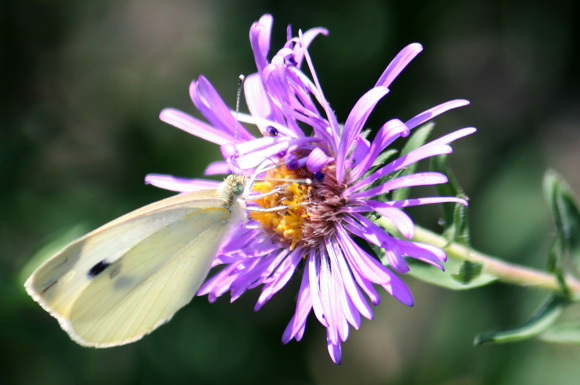 The Cabbage White is an EKG flyer – kind of erratic, up and down up and down – but it will land close to the ground on plants, leaves or flowers and may even just pull up at a spot in the grass. It’s a small butterfly, but not as tiny as some blues or hairstreaks. The Cabbage usually sits with its wings in a closed position, and it will flap sometimes in a rest position, but most often will move on fast. If your goal is to land a photo, most Cabbage Whites disturb easily and you may have better luck shooting from a distance. It’s a three season species – spring to fall – and you can find a Cabbage White in the city as easily as you would in a garden or a field.